Neglecting to ask specific questions — Arrive with a list of several prepared questions about the company, the position and the people who work there. Ask questions that begin, What, How, and Why. Avoid simple yes/no questions. This gives you some control during the interview and avoids the feeling that you’re in an interrogation. Get your interviewer talking as much as possible. Then take notes. Failure to interview the company — You’re not here to ask for a job, you’re here to interview the company. Your objective at the interview is to find out whether this organization is a good fit for you. At the same time, get your interviewer to reveal what a “good fit” means to him or her. This might be a question you ask during the course of the interview. Compromising your position — You should always walk in the door as an equal of the person conducting the interview. You have no reason to compromise your position. Doing so puts you at an immediate disadvantage. Some interviewers love to create an aura of superiority. Don’t grovel. Remember, you don’t have to give up anything, including your self-respect, in order to get this job. Simply answering questions — The interview is not an interrogation—it should be a conversation. Don’t just answer their questions. That’s why you’ve prepared your stories, which will be your moments to shine. When you do answer any questions, if at all possible, make sure that you answer immediately and follow up with a question of your own. Making incorrect assumptions — Don’t guess what your interviewer means by something he or she may have either said or asked. Effective interviewing is all about collecting information in real time, taking good notes, and responding only to the actual facts you’ve collected. If you find yourself making assumptions or guessing about something that was said, stop and ask for clarification before you answer. Getting emotional — Sometimes an interviewer may hit a nerve or consciously try to provoke you into an outburst. Don’t fall for it. Clear your mind of any fears or expectations so you can maintain a calm, open-minded perspective at all times. Poor non-verbal communication — First, demonstrate confidence by standing straight and tall. 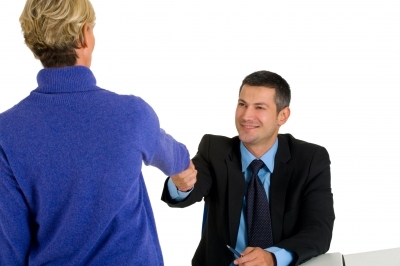 When you enter the interview room, make eye contact and offer a strong handshake with your interviewer. If necessary, jot their name on your notepad as soon as you seat yourself. Do the same for any other individual you are meeting with. Talking too much — Telling your interviewer more than they need to know could be fatal. Your stories should be 60 to 90 seconds long and they should have a relevant point. Stick with your rehearsed stories, and focus on your research and the questions you need to ask. Don’t fill up the silence with unnecessary talk. Becoming too friendly — A good interviewer will be skilled enough to put you at ease within the first 10 minutes of the interview. However, that doesn’t mean that they have become your best friend. Don’t let your guard down now—use your research and pre-interview prep to carry you through the rest of the interview. Treat this from start to finish as the professional business meeting that it is. Remember, a job interview can blow up in the face of an inexperienced candidate. You don’t have to fall victim. When you plan ahead, you can easily avoid the major pitfalls in any interview and maintain calmness, and confidence. You already know you can do the job, now, make sure the interviewer knows you can, too!